Want The Latest GMail For Your Phone? 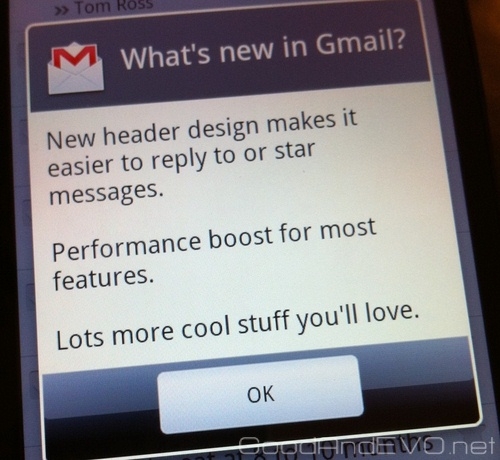 'It hasn't been officially released yet, but an updated version of Gmail (2.2.1) is out and ready to replace the existing app on your HTC EVO 4G. Among the new features are improved performance in most areas of the app and a revamped header that makes it much easier to reply to and forward messages." If you're dreaming of the newest GMail build that you've seen floating around, download links are apparently now leaking out via XDA Developers and other sites. The main update is the floating header that keeps reply, forward, and reply to all buttons easily findable (Although I keep scrolling to the bottom looking for the old ones...). It's also built into the latest version of CyanogenMod.